Not long ago, as part of our efforts to train health practitioners in how to treat CFS and fibromyalgia, I produced an eight-hour online course that can be taken on a self-paced basis. 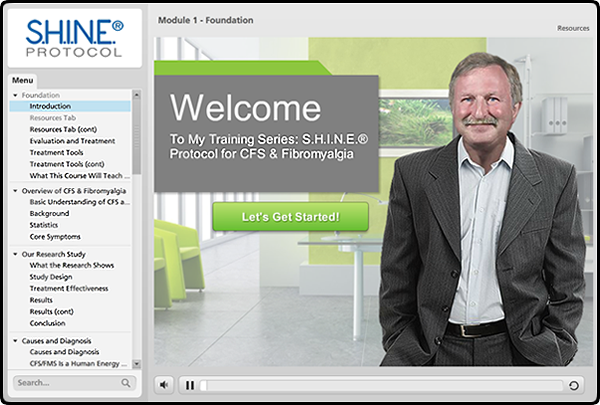 The course is titled "Dr. Teitelbaum's S.H.I.N.E.® Protocol for CFS & Fibromyalgia," and although it's geared to health practitioners, I purposely kept its content and language non-techie and easy to understand for laypeople. But many people who aren't practitioners have also asked to take the course. These are people who have fibromyalgia but aren't working with a trained practitioner, and they're searching for in-depth understanding of how to get well on their own. Or even just want to learn how to guide their own health practitioner. So I've decided to make it available to you — because the training is easy to follow and will empower you to get well, whether or not you have a trained practitioner to work with. Watch this free sample of the course (click to enroll in the course marked "Free Sample Module"). The full course is 6-8 hours of self-paced, audio/visual lessons on how to treat CFS/FMS using my research-backed S.H.I.N.E.® protocol. Though it normally sells for $695, I've now dropped that to $195 for the next four months! The web-based course covers 9 different topics over separate modules that you can take at your own pace, breaking them into as many sessions as you like. You also retain permanent access to it, so you can return whenever you like to refresh a needed lesson. Doing this, you will have a strong understanding of what causes CFS and fibromyalgia, and the step-by-step details for how to make it go away. Without having to wait for the medical profession to catch up! This enjoyable course will empower you with the knowledge of how you can get well NOW! Do you feel like life is passing you by, as you struggle with constant pain? If so, you may also suffer from other symptoms, like insomnia, fatigue, depression, and chronic illness. My friend and colleague, Dagmar Bauer-Prigatano, licensed acupuncturist, can guide you. She's worked with many people who were living with debilitating pain, and in her efforts to ease their suffering, she became passionate about thoroughly understanding it: the nature of it, underlying causes, and treatment options. Now she's created her free pain summit to help as many people as she can to transform their lives. This complimentary, educational virtual event kicks off on April 17, and brings together 20+ individuals (including me!) who have dedicated their professional lives to easing pain. We want to share our best tips on how to get rid of the pain that has been plaguing you, because there ARE options.